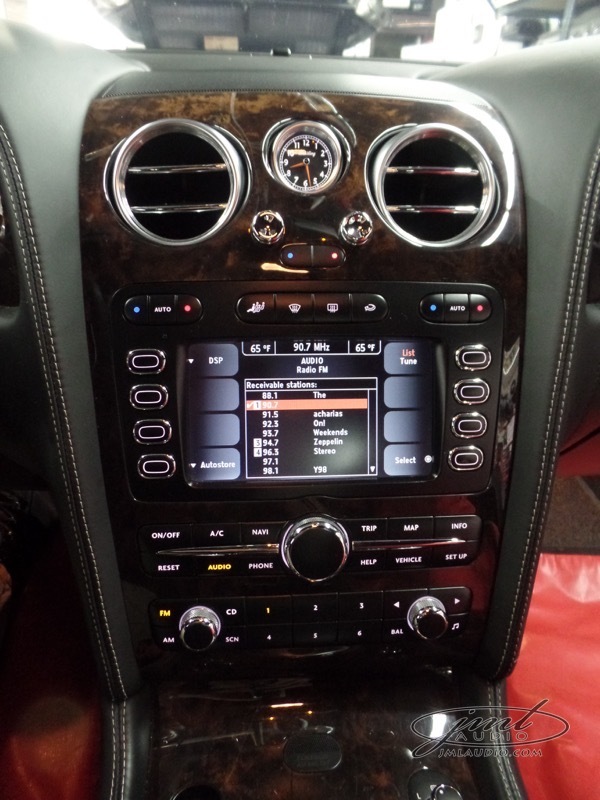 A repeat client from St. Louis contacted JML Audio about a technology upgrade in his 2006 Bentley Continental GT. Our team scheduled a consultation appointment so we could look over the vehicle and spend one-on-one time getting to know the client. During our meeting, we shared ideas back and forth. Afterward, we created a proposal that we felt best met his needs. He liked what we presented, so we set a time for him to drop off his GT. The factory radio was definitely behind-the-times. While a Bentley has classic styling that will stand the test of time, the electronics in the vehicle will not. In 2006, the audio system was average. Fast-forward to 2017, and it is way behind the times. Here at JML Audio, we say these vehicles need a “Modern Technology Upgrade” package. Once completed, this package gives the client lots of the technology found in a brand-new vehicle. BMW, Mercedes, Porsche and Lexus are some of our most popular vehicles for the technology upgrades. Our team of experts was able to utilize the factory backup camera for the new system. A Bentley is one of the most challenging vehicles for a modern technology upgrade. Everything from the dash area to the climate controls, audio and more present significant demands. Fortunately, our staff loves a good test. 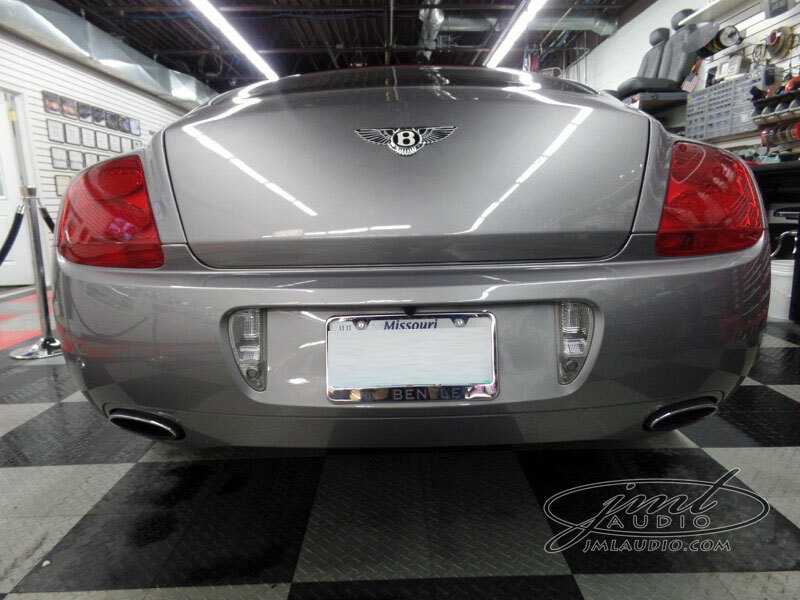 During our research and development on this vehicle, we realized the following Bentley models could receive this game-changing upgrade: the 2004–2011 Bentley Continental, Bentley Continental GTC, Bentley Flying Spur and Bentley GTs with a full-color factory screen, with or without a factory backup cameras. Our team was able to keep the factory steering wheel audio controls working, as well as integrate the existing backup camera into our new unit. We also kept the Bentley audio system and the factory climate controls and vehicle functions intact. As you can see in the final pictures, the end result was a modern technology upgrade that looked like it came directly from Bentley. That is the driving goal at JML Audio. A look at the original radio (Left) and our retro-fit new dash panel (Right). In-dash navigation was now at the client’s fingertips. Another tech upgrade the client got was the ability to listen to satellite radio. The existing backup camera was integrated with the new radio. After a bit of work, we were able to integrate the factory steering wheel controls with the new radio. Our team planned the upgrades around a Kenwood DNX893S GPS Navigation system that includes a 6.95” touchscreen display. The client instantly gained popular functions like CarPlay and Android Auto smartphone software, Bluetooth for hands-free calling and music streaming, HD radio, and a pair of USB ports. Real-time traffic re-routing is a standard feature, so the integrated Garmin navigation will route him around traffic problems. The client lost none of his existing technology, yet gained all these wonderful features. The OEM CD changer was located in the glove compartment. The CD changer was replace with a pocket in which the client could store devices that would plug into the radio via USB. The ashtray storage area was converted into a phone holder. The client loved the convenient storage spot for his phone! One of the reasons you buy a Bentley is for the beauty. It starts on the outside with curvy lines that can make you stare for hours. It continues on the interior with a mixture of chrome, leather and wood that makes you think it is more of a luxury cockpit than an automobile. A normal phone holder that sticks out of the dash wouldn’t suffice, since it would detract from the elegance and look out of place. Yet, we all carry smartphones and want a good place to put them when we enter our vehicles. The team at JML Audio came up with a beautiful solution. We re-engineered the ashtray and made a custom mount to hold his Samsung phone. We used an Audioquest signal cable to charge the phone and provide excellent signal quality to the Kenwood receiver. As you can see in the pictures, the finished product looks like Bentley designed it that way. After our team had done a detailed check on all the functionality of the new electronics to confirm everything was working perfectly, it was time to give the Continental GT back to the client. As we showed him our work, he was amazed at the fit and finish, and just loved the way our team gave him 2017 technology in his 2006 vehicle. If you have a vehicle that you love that has aging technology, chances are we have a solution. When you are ready to get a modern technology upgrade for your vehicle, we invite you to contact JML Audio of St. Louis by clicking HERE. Our staff will set a time to get together with you and your car, truck or SUV and determine the best solution for your needs. Let us show you why people come from hundreds of miles to experience the JML Audio touch.